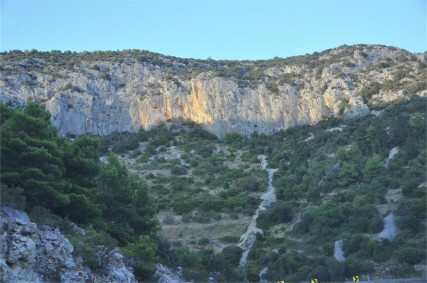 Pandolovica is a recently developed crag which is overlooking the road above the Milna bay. The crag can be climbed all through the year, although summer afternoons are too hot. Rock is facing south which means a lot of sun. The belayers and children will be protected from the sun by trees. The crag has potential for several more routes. Please do not place bolts without consulting with us using the contact info here. We are trying to make sure that the equipment used is adequate for marine environments and that the crags are being developed in accordance with the local standards. Children – Great area under the rock. Approach a bit steep, but manageable. Equipment – Sport climbing equipment, up to 70m rope, up to 15 quickdraws. If you are driving from the town of Hvar, you will see the direction sign to the crag on your left just before the village Milna. Follow the sign and after a warm up access lasting 15 minutes, you are ready to climb and enjoy a view of the Adriatic sea. If you are driving from Jelsa/Starigrad and other places on the north side of the island, take the road towards Hvar, go through the tunnel and after you reach Milna, you will see a sign directing you towards the crag. See our interactive map for details. As in all cases on Hvar, you may be passing over private property to reach the crag, so be respective to the owners and leave everything as you found it. During the summer, it tends to be too warm in the peak season, but climbable in the morning and in the afternoon. In other seasons, it is a perfect spot to enjoy the effect of sunny Hvar on your mood.